Online shopping is a favorite past time for many people…the ease of use, shopping special deals and access at anytime make it a convenient way to get what you need without ever leaving the house. That said the number one way to lose a customer to force them to jump through hoops to complete their online purchase. Complicated logins and confusing interfaces is a conversion rate nightmare. No matter how much your customer wants your product. A large portion of shopping carts are abandoned mid process. Though there are many reasons why this could occur …a complicated or cumbersome check-out process is a major factor. If you have a online Magento store, you have no doubt put a lot of time and energy into it. You have also undoubtedly worked hard to drive to traffic to your website. If you answered yes, its in your best interest to consider streamlining your checkout process. Adding Social media logins at checkout is one newer way to accomplish this. Social media logins are tied to your customers social media accounts online (such as Facebook, LinkedIn or Twitter account). No long registration forms to fill out, just a “one-click” login. This can truly make a difference in the overall shopping experience, especially for that user who may be ensure of their purchase. By making it so simple and fast, users are not tempted to change their mind or abandon their cart half-way to go check our your competitor. Social Logins also eliminates the need for the customer to create yet another login to remember for your website, simply “Login with Facebook” …and they are in, which is time saving and encourages repeat sales. Mobile traffic now accounts for 50.3% of all E-commerce traffic. That being said, have you every tri ed to checkout on a mobile device and were forced to fill out lengthy registration forms on a small touch screen? Most of us have and its not fun. 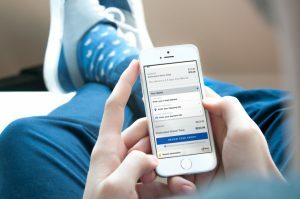 Social logins will allow your customers on mobile devices to bypass the potentially frustrating experience of checkout on mobile and quickly execute their purchase. Dont lose your mobile Ecommerce customers due to a complicated checkout! As mentioned above the social logins are tied directly to the users online social accounts, which supplies you with a huge amount of data available for marketing. You can see who your clients are and market directly to them. This is incredibly useful when personalization and segmentation come into play. You could always ask your customer to fill out forms to gather this type of data …but isn’t this exactly what puts users off to begin with? With Social logins…all of the information is there for the taking. Social logins create a speedy and more secure login process for users, and they provide much needed marketing data for eCommerce retailers. If you don’t offer social media logins on your site, why not?